With all the interest in a Mac netbook, we're seeing more and more online tutorials explaining how to get Mac OS X 10.5 "Leopard" installed and running on several small notebooks. This week we link to several that focus on the MSi Wind, a 10" netbook available for as little as $349. Which Third Party Monitors Work Well with New MacBooks? "This morning the MacBook was still running fine with no freezes and I was starting to feel pretty good about the fixes but that didn't last long. Just a while ago my MacBook froze up while sitting idle, exhibiting the same errant behavior that plagued me before the update and that has been reported by many in the Apple support forums. It appears that Apple still has some work to do to fix these system hangs which I have proven with my own testing only occurs when >3 GB of memory is installed...."
"The new SMC and EFI firmware updates for the various 'Late 2008' (unibody) MacBook models have, for the most part, installed and worked properly. Users have reported the resolution of various issues, and the relative scarcity of questions on the Apple Discussion boards indicates that the updates are, generally, working as they should. "Still, there have been one or two people for whom the updates have introduced new problems. One user had a Siig eSata expresscard for connecting some external hard drives, but after the firmware update the card is no longer working. Another user found problems with his displays not properly switching when he plugs in an external monitor. It seems that the computer now will not recover the original display after unplugging an external monitor...."
"It appears that our friends from Apple have leaked some drool-worthy information on the net with their latest concept, the triBook. TriBook notebook as conceived by MacLife. 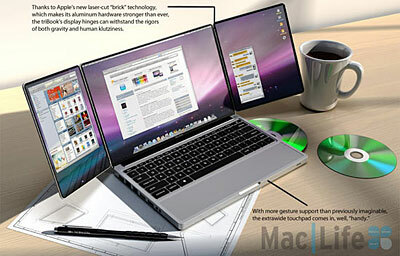 "Yes, I am also quite impressed at a screen that can fold out into three. These side screens are perfectly sandwiched in between the main display and the keyboard. Every time a user wants to use the triBook, he or she will unfold it like opening a cardboard box. A user also has the option of combining all three screens for a landscape display of about 21 inches. "An unfolded triBook measures at 6.75 x 10 inches, and it is about 1 inch thick. That may not be good enough to fit into a manila envelope like the MacBook Air, but I am willing to sacrifice the skinniness for that fold-out feature." "WingBook" PowerBook as conceived by Anne Onymus in 2002. "I have decided that I am indeed going to sell my 17-inch MacBook Pro and use the new aluminum MacBook as my primary computer. To do that I will need to connect a big monitor to the MacBook at the desktop so I can have plenty of screen real estate. I ordered one of the new Apple 24-inch Cinema Displays last week for a number of reasons, primarily because I knew it would work well with the Mac. The display was back-ordered and wouldn't ship until next week and yesterday due to second thoughts I canceled that order. "The more I thought about the high cost of that Apple display the harder it was for me to justify paying it. There are many third party monitors available today that sell for less than $400 and it's just lunacy to pay $900 for an Apple-branded monitor. So I canceled the order and now I'm looking for a good alternative...."
Link: What 3rd Party Monitors Work Well with New MacBooks? "Notable merchant of Mac clones, Psystar, added another argument to its countersuit against Apple, yesterday. "Reports have surfaced that the company is accusing Apple of burying code in Mac OS X 10.5 Leopard that blocks anything that doesn't faintly resemble a Core 2 Duo, further extending Apple's grip on who and what runs their operating system. "According to Psystar, the fruity OS will run code at boot that checks which processor your system is running and shuts down in the event it isn't a Core 2 Duo processor. This unknown bit of code, present in Mac OS X Leopard, claims Psystar, is further proof of Apple's sneakiness. True, Apple only has Core 2 Duos in its current Mac range, with the exception of the Mac Pro that uses Xeons on Mac OS X Leopard Server - hardly the budget philosophy you'd see at Psystar." "External storage supplier La Cie has found a way to quieten its external drives by adding staggered notches to the trailing edges of the fan blades. How does that work? "This is my understanding of the airflow and acoustics involved. A typical drive or CPU-cooling fan has, La Cie says, seven blades. These blades are angled and, as they spin, they cut into the air and send it at higher pressure (pressure side) underneath the fan blade and at lower pressure (suction side) over the top of the fan blade. The two airflows meet and merge at the trailing edge of the fan and vortices form as the two flows' different pressure levels get equalised. "The tumbling together of the airflows creates noise. What Noctua, a La Cie partner in Austria with a Taiwanese manufacturing link, found was that a smooth uninterrupted trailing edge fan blade line was not ideal. Instead, by putting notches in this edge, the upper and lower fan blade airflows joined at varying points along the trailing edge and this reduced the perceived noise level." "While it would be nice if Apple released a small, light and cheap netbook, it doesn't appear to be likely any time soon. "If you can't wait for Apple to make up its mind you can create your own Mac OS X netbook today courtesy of a DIY tutorial posted by Wired's Gadget Lab." "There is something about a small MacBook that gets everybody in a dither. Since the appearance of the first netbook a bunch of smart folks have spent a lot of time getting OS X to work on them, even without Apple's help. Not that we approve of such antics, that one time that OS X got on Kevin's netbook was a real mystery as it just appeared overnight. Honest." "We know that you don't want to release a netbook, Mr. Jobs, and we respect your stance that you don't want to sacrifice quality and besmirch the Apple name with a sub-standard product. That said, it's beginning to look like other companies may not be content to sit by and wait while you come up with an ingenious way of revolutionizing cheapo laptop construction, making it affordable and of high enough quality to bear the Apple logo. One such company is Realtek, who've recently released OS X drivers for their WiFi network cards, which reside not, where you might guess, in Apple laptops, but in the MSi Wind." "The flat keyboard is an acquired taste. The faster model adds a backlight to the keys . . . but light spills around the edges as well as through the key caps, rather spoiling the effect. "This is undoubtedly a desirable laptop, but the price looks high, especially as Windows costs extra...."
"The unibody composition also makes these new laptops easier to service and fix, and great for do-it-yourself types who, in the past, have lamented how difficult it was to do things like swap out the hard drive or battery.,,,. "As someone who's used the Mac's trackpad buttons for years, I found this new design hard to get used to. The unified trackpad/button may cause you to fundamentally change the way you use your Mac laptop. Because the button is so large (and to my hands, harder to click with my thumb as many people are used to doing), some will wind up using hand gestures almost all the time. "The all-in-one trackpad is another question . . . And the battery life is disappointing...."
"Prior to October 14th of this year, Apple hadn't updated its Cinema Display line in years. Literally. There's no doubt that this refresh is entirely overdue, and we still hold that Apple should've taken the opportunity to refresh its now-archaic 20 and 30-inch counterparts. All that aside, this writeup is about the new 24-incher, a LED-backlit beauty that doesn't mind being called glossy and is clearly partial to notebooks. The screen packs the same 1,920 x 1,200 resolution that was on the 23-incher it replaced, but ditches that DVI connector in favor of the newer, less widely adopted DisplayPort. So, is the newfangled screen worth $899? Read on to find out." PR: MacMagSaver is a snap-on protector for the Apple notebook MagSafe adapter magnetic tip, which keeps the cable from cracking (a very common issue with MacBooks and MacBook Pros recently according to tech service sources). 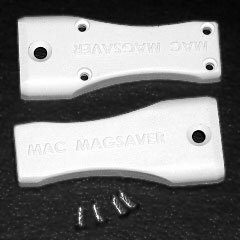 The MacMagSaver is designed for long-term protection of your MagSafe. The manufacturer's magnetic tip is designed to be short and compact, but repeated use will cause the wire to crack right at the block, necessitating replacement of the power adapter. The inexpensive MacMagSaver's patent-pending protector snaps on and gives permanent protection against stress on the cord. The MagSaver protects the unit by moving this point of friction away from the tip and to a location with little force or pressure on the wire. Designed and manufactured solely in the USA. 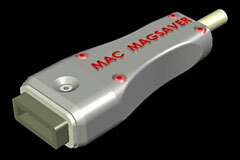 MacMagSaver is made from recycled materials for a greener footprint. Installation of MacMagSaver takes less than a minute. Simply slide your power pack tip into the casing, wrap the wire through the wire retention posts, and then put the cover on it. Use a pen or car key to press the retainer pins in place, and you're done. Manufactured of high impact ABS plastic, using new and recycled materials, MacMagSaver carries a lifetime warranty and a 30 day money-back guarantee. The price is $11.99 per unit plus $2.99 shipping. Order 5 and get free shipping. Also available is a rebuilt original power pack with MagSaver preinstalled. "Duckhead" prongset is included. Only original manufacture circuit boards and components are used, and all units are guaranteed for 6 months against defects. PR: Newer Technology, Inc. (NewerTech) has announced the NewerTech MAXPower 802.11g/b Wireless USB 2.0 Stick Adapter, a Plug and Play 802.11g/b wireless adapter that enables owners of USB 2.0/1.1 equipped Macs and PCs to affordably upgrade their wireless home and office networking performance with up to 5 times faster data transmission rates over 802.11b standards. With full OS X support for Plug and Play operation straight from the box, the MAXPower 802.11g/b Wireless USB 2.0 Stick Adapter offers fast and stable wireless networking at home, at the office, and at mobile hotspots. 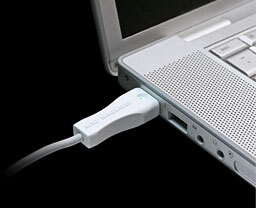 It enables owners of USB 2.0/1.1 equipped Macintosh desktop and notebook computers, such as PowerMac G4, iMac G4, PowerBook G3/G4 and iBook G3 models that didn't include built in wireless or have a non-working AirPort card, to easily add wireless networking capabilities or upgrade their existing performance. 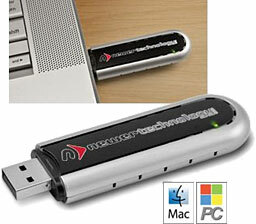 The MAXPower 802.11g/b Wireless USB 2.0 Stick Adapter delivers five times faster performance over the factory AirPort 802.11b card, as well as offers Mac and PC users backwards compatibility with 802.11b wireless standards so users can download email, MP3s, and videos wherever they roam. Installing and using the MAXPower 802.11g/b Wireless USB 2.0 Stick Adapter to start sharing Internet access, media files, and network resources is a simple matter of plugging the adapter into an open USB 2.0/1.1 port on a Mac running OS X 10.3.9 and later or PC running Windows 2000, XP, or Vista operating systems and loading the included CD-ROM. Fully Mac OS X 10.3.9 and later supported with onscreen menu setup, CD-ROM with drivers and user guide. Easy to connect via USB 2.0 and USB 1.1. Up To 5x faster than 802.11b. Backward compatible with 802.11b networks. Ideal for high data rate needs like video streaming. Advanced security features: 64/128/152 bit WEP, WPA/WPA2. The NewerTech MAXPower 802.11g/b Wireless USB 2.0 Stick Adapter is priced at $24.99 MSRP and is available immediately from NewerTech's exclusive distributor, Other World Computing (OWC), as well as through the retail channel. 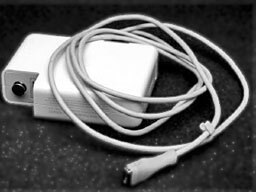 The adapter comes complete with Mac and Windows drivers and a user manual. The new adapter joins the existing MIMO based MAXPower 802.11n/g/b wireless line from NewerTech which features the MAXPower 802.11n/g/b Wireless Router priced at $67.99; the MAXPower 802.11n/g/b Wireless PCMCIA Laptop CardBus Adapter priced at $49.99; the MAXPower 802.11n/g/b Wireless USB 2.0 Stick Adapter and Extension Cradle priced at $49.99; and the MAXPower 802.11n/g/b Wireless PCI Adapter with moveable antenna base for desktop computers priced at $49.99. "The design team worked hard to craft our soft-touch, hard-shell cases for the new MacBooks in time for the holiday season," said Irene Baran, CEO of Speck. "SeeThru Satin gives your MacBook a rich, frosted appearance and a very personalized and comfortable feel, all while protecting it from scratches and scuffs." Designed exclusively for the recently announced new 13" MacBook and 15" MacBook Pro, the SeeThru Satin snugly protects your MacBook like a perfectly-sized, custom-fit glove. The smooth-to-the-touch rubberized exterior coating gives the MacBook a feeling of comfort and extra grip in your hands. With the durable, ultra-thin profile and easy-on/off two-piece hard shell design, users can shield their notebook from scratches and bumps while still enjoying access to all key features and functions including side battery indicator button, trackpad, keyboard and all connection ports, without the need to remove the case. Integrated rubberized feet help stabilize and create extra grip on slippery surfaces and the shells are fully vented to optimize heat dissipation from the notebook. SeeThru Satin is the perfect add-on to personalize and protect your MacBook, whether you're carrying it alone or in a sleeve, briefcase, backpack or other bag. The SeeThru Satin is available in Black, Purple and Red with additional colors available in January 2009. The SeeThru Satin is priced at $49.95 MSRP and available at Apple stores and online at speckproducts.com and the Apple Store. Accent the sleek look of your 15" MacBook Pro notebook (older, silver keyboard model)! Get great hard case protection, a hint of color and a massive dose of shine. 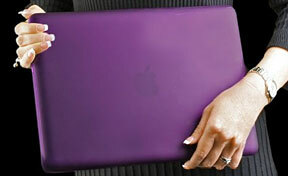 SeeThru MacBook cases are made of translucent hard plastic to beautify and protect. PR: Other World Computing (OWC) has announced the availability of new performance upgrade options and same day to 48 hour shipping for the Axiotron Modbook, the world's only Mac-based tablet computer that lets users draw and write directly on the screen. OWC is the exclusive US-based distributor for Modbook, as well as being fully certified to convert existing MacBooks into full-featured Modbooks via the Modservice program. Add up to 6.0 GB of performance DDR2 memory. Up to 500 GB 7200 RPM performance Serial ATA (SATA) storage in main hard drive bay. Up to 250 GB of additional capacity can replace standard optical drive for up to 750 GB total storage capacity. Dual Layer SuperDrive with up to 8X DVD-R burn, 2X DVD-DL burn, 3X DVD-RAM, & 24X CD burn. Available Three Year Extended Warranty covers the original MacBook components, any customer selected upgrades installed by OWC, and the tablet components. Since being named a Best of Show Macworld Expo award winning product, the Modbook has been a product in high demand. Having secured a larger and more consistent supply of conversion kit components, OWC is now able to ship Modbook orders as fast as same day received. "We're very pleased to offer Modbooks and their new upgrades with rapid order fulfillment," said Jennifer Soule, National Sales Manger, OWC. "Now not only can customers get a unique, high performance tablet based Mac, but also one that comes backed by a commitment to high standards of customer satisfaction." OWC offers consumers a variety of Modbook purchase options. A new Modbook tablet computer starts at $2,249 with a base configuration including a 2.1 GHz Intel Core 2 Duo processor, 1.0 GB memory, 120 GB hard drive, and a CD-RW+/DVD-ROM Combo Drive. 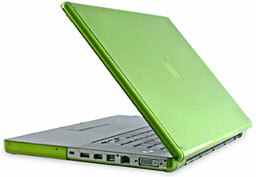 A second Modbook model priced at $2,479 adds a faster 2.4 GHz Intel Core 2 Duo processor 2.0 GB of memory, 160 GB hard drive, and a SuperDrive Dual-Layer DVD/CD burner. Both models come with a standard one year limited hardware warranty. Owners of existing Intel Core 2 Duo white or black MacBook computers can select the "Bring Your Own 'Book" (BYOB) Modservice option and have OWC fully convert their MacBook into a full-featured Modbook with all of the same functionality that has earned Modbook numerous awards and accolades. Modservice prices start at $1,299.99 for the turnkey service, which includes a protective shipping box and FedEx shipping to and from OWC. No 2.4 GHz Black MacBooks or 2.4 GHz Early 2008 15" MacBook Pros this week.